Payment Approach: Candidates have to pay the above application fee structure through the State Bank Collect only. · Minimum Age Required: 21 Years. · Maximum Age Required: 50 Years. Post-Graduation and also completed B.Ed degree. 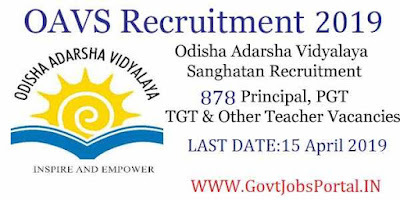 Those applicants who have 2 years Integrated Post Graduation Course or PG in relevant discipline & also complete their B.Ed qualification can apply for this OAVS Recruitment 2019. Candidates having 4 years integrated Degree course or Graduation Degree in Arts and Sciences Subjects can also apply. Graduation Degree (or) PG Degree (Physical Education) i.e. B.P.Ed./ M.P.Ed can apply for these posts. Applicants who have passed in their following degrees: “B.E./ B.Tech. in CS or I.T. Stream / MCA/ M.Sc. (IT) or BCA/ B.Sc. (CS)” can also apply. 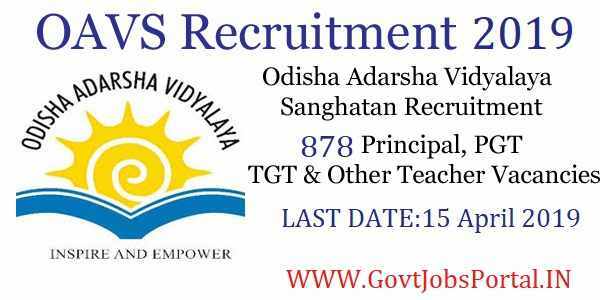 Applicants need to apply through the online application form for these Govt Jobs in Odisha State. There is no other mean of application for applying. You have to visits to the official website of OAVS website for online application. We share above the link for applying online for these teaching job profiles. The Link for online application will remain active till 15 April 2019, after that link will be disable for online application. So apply as soon as possible for this recruitment procedure. But you can pay the application fee till 17th April 2019.